Welcome to Beyond Rubies 2019! Whether you’re a first-time participant or you’ve been coming for the past 35+ years – we invite you to join us to experience an unforgettable event guaranteed to inform, inspire, and empower. 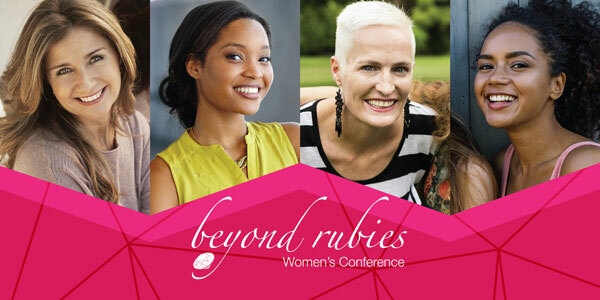 Beyond Rubies is a conference for women of all generations and backgrounds to learn practical ideas on how to succeed, while juggling increasingly complex and diverse life demands. You will be engaged in an exciting, fun, and inspirational atmosphere, where women come together to network. This year, we are featuring an upbeat, one-day conference that will have professional development and personal growth topics. The day will include not only a stellar keynote presentation, but also the opportunity to attend four breakout sessions of your choice. The conference will set the tone for building better lives while enjoying the journey. The focus will be to provide information on a full range of issues – in the workplace, at home, and in the community. We encourage you to attend this year’s conference and participate in the wonderful opportunities Beyond Rubies 2019 has to offer. We look forward to seeing you in March! Buckle up, and be ready to be entertained, interactive, energized, and enter a new way of thinking! Have you ever had someone know just what buttons to push? We all have, and that’s why Candy loves to teach folks how to get their emotions under control. In this session, you will laugh and learn a lot in an hour about your emotions and how to CALM DOWN without someone saying “Calm Down!” In this session, we will analyze your emotions by exploring what aggravates you by knowing exactly what tics you off! Then we will discuss how to manage the obstacles so you can choose your emotions by being proactive NOT reactive, so you will have a clear head to recognize the emotions in people who are not like you! Simple, right? I truly believe that “It Takes 4 to Tango.” We will go through an interactive exercise that teaches the four personality styles WITHOUT A TEST! Once you learn the Tango of your employees, employers, peers, spouse, or children, you will learn their emotions and then you can dance your way through ANY problem! Cue Tango music! Sellers & Seekers Real Estate Co.
Helena Long, VP, Leadership Development, JET Engineering, Inc.
Ready to register? Don't wait! The early bird deadline ends February 14th!